In the annals of mixed drinks, the Gibson is a kind of spectral presence. 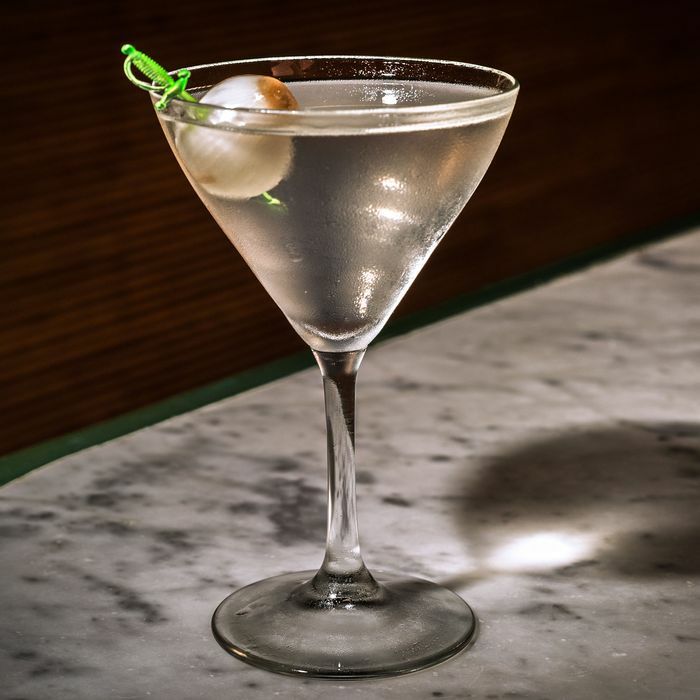 Though more than a century old, and enshrined in classic films like North by Northwest and All About Eve (always a good way to enter the cocktail canon), the drink still ranks as an also-ran, lingering in the massive shadow cast by its larger-than-life cousin, the mighty martini. Bartenders sense the drink’s self-esteem issues and aren’t always sure how to address them; if you ever want to cast a mixologist into a quandary, ask them if they consider the Gibson a cocktail in its own right or merely a martini with an onion. They will pause, look thoughtful, even troubled for a fleeting moment, before carefully delivering their answer. No two replies will be the same. Lately, though, it looks like the long-suffering drink might be getting some much-needed love, as a handful of prominent cocktail bars in New York and elsewhere are doing the Gibson up proud. Essentially, a Gibson is a mixture of London dry gin and dry vermouth, with a pickled cocktail onion serving as the garnish. Part of the reason why the Gibson has been such a laggard in the cocktail revival may be that garnish. While mixology havens have routinely made their own cherries and bitters for some time now, the cocktail onion doesn’t seem to have been worth the bother. Even today, order a Gibson at many respected drinking dens, and they’ll fish two or three flavorless white orbs from a slim jar bought at D’Agostino. Yet if the onion is what makes a Gibson a Gibson, it ought to be fussed over and perfected. The new breed of Gibson standard-bearers all pickle their own plus-size alliums, each with a very personal twist. In Cobble Hill, Long Island Bar’s pickling solution contains a host of botanicals, including juniper berries and a defining note of dry gin. In keeping with their local, seasonal approaches, Franny’s and the Breslin garnish their spring and early summer Gibsons with pickled ramps. Hatchet Hall, a new restaurant in Los Angeles, adorns its roasted-onion-infused Gibson with pearl onions pickled in Champagne vinegar, cardamom, lime, lemon, coriander, juniper berry, and bay leaf. In Gramercy, Dear Irving — which uses a recipe from Todd Thrasher, a D.C.-area cocktail innovator — employs a red onion, lending the drink a striking visual. The onion at San Francisco’s ABV, too, adds a dash of color. Instead of a pearl onion, the bar pickles slices of a normal-size onion using red wine vinegar. The result looks like a pink twist. In the past there have been isolated attempts at Gibson enhancement. In the ’90s, at the Hudson River Club in lower Manhattan, general manager Nick Mautone and chef Waldy Malouf collaborated on the Green Market Gibson, using housemade onions. (Mautone revived the drink at his recently closed Heartwood in Chelsea.) And in D.C., Thrasher has been pickling a wide variety of Gibson-ready pearl onions for a decade. Now, with nouveau Gibsons, the recipe itself is being reexamined as well. Both Dear Irving and the Happiest Hour in Greenwich Village add sweeter blanc vermouth to the mix (instead of straight dry vermouth), as well as a bit of onion brine. Irving’s uses only Carpano Bianco vermouth — no dry vermouth at all — making for a much sweeter, smoother Gibson. It’s an unusual take, but a harmonious one. The Happiest Hour splits the vermouth between sweeter Dolin blanc and dry, essentially creating “a slightly dirty, perfect Gibson,” in owner Jim Kearns’s words. The deciding issue regarding the drink’s identity crisis may not be the onion at all, but the drink’s tenacious nomenclature. The name Gibson was first applied to a gin-vermouth mixture in the late 1890s in San Francisco. (Recipes at that early stage called for neither bitters nor onion. When the all-important vegetable made its debut is a matter of mystery, but it was firmly entrenched by the postwar years.) If the drink is such a weak pretender to the martini throne, the title Gibson should have died out decades ago. But it hasn’t.